Author(s): Entsar I. Rabea, Mohamed E.I. Badawy, Department of Pesticide Chemistry and Technology, Faculty of Agriculture, 21545-El-Shatby, Alexandria University; Alexandria,, Egypt	Ahmed F. El-Aswad. Objective: A carboxylesterase (CbE) or carboxylic-ester hydrolase (EC 3.1.1.1) is an enzyme that catalyzes the hydrolysis of carboxylesters to alcohol and carboxylate. The objective of this study is to obtain this enzyme from liver and lung of rabbit with a comparison between the effects of two specific substrates, - naphthyl acetate (-NA) and p-nitrophenyl acetate (p-NPA) on the enzymes activity. The kinetic characteristics of the enzymes have been also investigated in details. 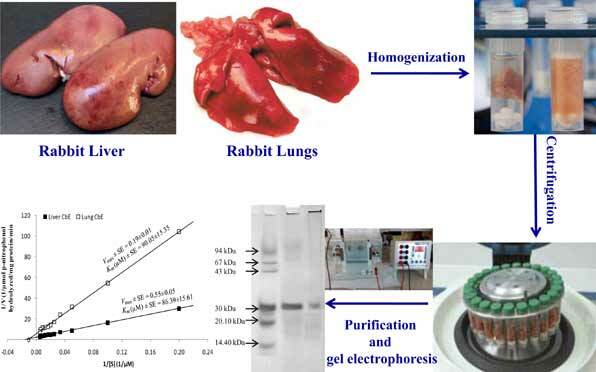 Methods: CbE was obtained from rabbit liver and lung with Tris/HCl buffer (pH 7.4) extraction, ammonium sulfate precipitation, dialysis, and lyophilized. Results: The lyophilized enzyme appeared to be homogeneous on native polyacrylamide gel electrophoresis and its molecular mass was estimated to be 30 kDa suggesting a monomeric structure for the obtained enzyme. The enzyme exhibited a broad activity at different pH and temperature. The pH optimum was 7.5 and optimum temperature was 35ºC. The enzyme showed specific activities of 1.36 and 1.04 mol -naphthol hydrolyzed/mg protein/min for liver and lung CbEs, respectively using -naphthyl acetate (-NA). However, the specific activities of the liver and lung CbE were 0.44 and 0.23 mol p-nitrophenol hydrolyzed/mg protein/min, respectively using p-nitrophenyl acetate (p- NPA). The relationships between estimates of Km and Vmax calculated from the Michaelis-Menten equation have been explored. The Km values of liver and lung CbEs were 59.28 and 28.10 M with -NA, respectively however, the values were 86.39 and 90.05 M with p-NPA. The Vmax values of liver and lung CbEs were 2.32 and 1.05 with -NA, respectively however, the values were 0.55 and 0.19 with p- NPA. The enzyme showed residual activity when incubated at wide range of pesticides chlorpyrifos and methomyl however it was totally inhibited by concentrations higher than 200 M. The extent of the inhibition was different, as estimated by the values of the inhibition constant Ki that were found to be 2.14 and 5.14 for chlorpyrifos and methomyl, respectively. Conclusion: This enzyme may play an important role in the detoxification of organophosphorous and carbamate pesticides at low levels. Keywords: Carboxylesterase, characterization, enzyme kinetic, inhibition, rabbit liver and lung. Keywords:Carboxylesterase, characterization, enzyme kinetic, inhibition, rabbit liver and lung. Abstract:Objective: A carboxylesterase (CbE) or carboxylic-ester hydrolase (EC 3.1.1.1) is an enzyme that catalyzes the hydrolysis of carboxylesters to alcohol and carboxylate. The objective of this study is to obtain this enzyme from liver and lung of rabbit with a comparison between the effects of two specific substrates, - naphthyl acetate (-NA) and p-nitrophenyl acetate (p-NPA) on the enzymes activity. The kinetic characteristics of the enzymes have been also investigated in details.